While academic coaching includes elements of traditional tutoring, the goals and process of academic coaching reach further and deeper to teach students to become more effective learners, not simply to survive the crisis of the day. Using current school challenges as a springboard, we teach students Executive Function skills that help them develop the habits that allow them to succeed in school and beyond. While most tutors can help students complete their homework on time, Executive Function coaches also teach students to prioritize their homework based on due dates and the relative importance of each assignment. Academic coaches help their students set up proper study environments and establish routines to develop Executive Function skills such as focus and sustained effort which help them to eventually learn how to manage homework independently. Tutors will help students prepare for specific tests and exams, usually based on their expertise in the subject matter. 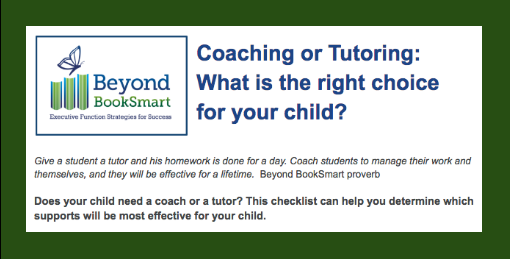 Academic coaches teach students to become better self-advocates and to know how to study for any test or exam. Students learn how to ask the right questions, to identify what they don’t know, and to find and use the resources that will allow them to do their very best. Most tutors don’t teach the self-management skills required for success on long-term projects. Our academic coaches have a strong understanding of how integral Executive Function skills are to completing long-term projects successfully. We employ foundational tools that tutors and teachers may take for granted and not teach in school. Executive Function coaches teach students how to see the many steps needed, how to sequence those steps, and how to map out the time needed to complete projects well and on time. Executive Function coaches demonstrate how to break down big projects into their component parts and how to build in steps for quality control. Unlike most tutors, academic coaches with a strong background in Executive Function skills know how to build in the supports needed to develop the student’s ownership of the project so that even the most daunting projects have a process that makes them manageable. Our academic coaches teach students how to be efficient readers across all subjects by using active reading strategies. Coaches help students learn how to engage with challenging material, focus on relevant details, comprehend what they are reading, and recall content afterwards. Tutoring is about helping students understand a subject so that they can do well in particular classes. Academic coaching (also known as Executive Function coaching) is about teaching students skills and strategies that apply to all classes and helping them become confident and independent learners, no matter what subject they are tackling. Which is best for your child? Download our checklist to help you select the best support for a struggling student. Beyond BookSmart was wonderful. They were able to get through to our daughter, get her organized, and get her back on track. Now, she is going to a great college and is fully prepared.